After a recent Redwell Writers meeting where guest Simon K Jones came along to tell us all about serialised publishing, I'm attempting to do exactly that for my science fiction novel Splinters. 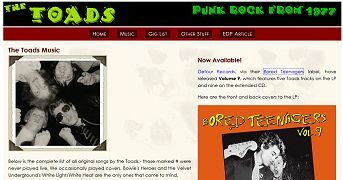 With the 40th anniversary of being celebrated by Punk In The East and the release of various old Toads tracks by Detour Records on their Bored Teenagers label, the Toads web site has had a number of new additions including updated information and some downloadable copies of various fanzines from 1977. The original Norfolk Knitters and Stitchers web site has now been joined by the new overarching Knitters and Stitchers site along with dedicated sites for Suffolk and Essex. 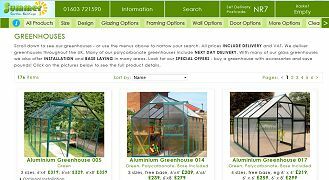 The Summer Garden Buildings web site has had another makeover. More mobile friendly and "picture centric" it has already given sales a boost over the last few months of the year. The Federation of Norfolk Archaeological and Historical Societies web site has now left its home on Poppyland and gained a new look along with its new domain name. The Redwell Writers web site has had a makeover to celebrate the publication of three new books this year. Go to the publications page for more information. A new site for the Cromer RNLI Lifeboat has been set up. Congratulations to Norfolk Knitters and Stitchers for being awarded their £250,000 lottery grant! More details can be found on the EDP web site. Norfolk Knitters is now Norfolk Knitters and Stitchers and they celebrate by having a makeover! Paul Stowe has a new web site, Remote Video Editing in order to promote his video editing service.